Ian Fitzgerald was an aircraft engineer working overseas for many years before deciding to settle back home. With an interest in starting his own business, he decided to start selling tyres, an interest that the Fitzgerald family had been involved in for many years. “It seemed like the practical thing to do. It was a massive undertaking and a big change for myself, but I got a van on the road and kitted that out and went around to farmers’markets where I started doing a bit of rewiring work on vehicles as well as selling the tyres,”said Ian. “When I first started, I had a premise in Roscommon town, but we then moved to a bigger location in Athleague and that is where we are today. Elite Servicing cover a wide range of vehicles from cars and vans to trucks and agricultural machinery, they have the expertise to find a solution to your problem. “There are six bays in the work shop and there are three full time mechanics here. We work on anything from a car to an articulated truck. 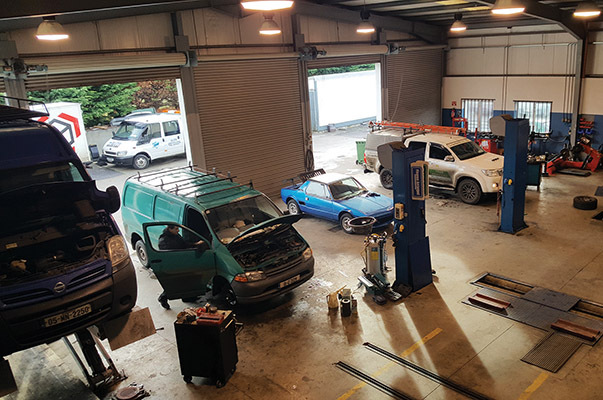 It is a state of the art purpose-built facility and as far as I know, we are the only business in Ireland that has a Mahe lane which is used for NCT and DOEs, for pre-testing. As the services expanded, so too did the customer base, and Ian revealed that the business is now built on the number of repeat customers that they have on their books. “Yeah a lot of people would be coming back to us alright, which is always a good sign. The customer base that we had in Roscommon all came with us when we moved out here. Another area of the business which has proven to be successful is LED lighting and reversing cameras for cars, vans and trucks. The company stocks all the leading brands of tyres and they have a wide price range to suit the customers’needs. Elite Servicing provide two types of service, a full service and an interim service. A full service is recommended Every 12 Months or 16,000km. This includes oil change, filter replacement, fuel and air filter, check/top up brake, clutch and power-steering fluid, check/top up anti-freeze coolant and windscreen wash, check auxiliary belts, check battery as well as looking for leads and change spark plugs. All of this is done under the bonnet. On the exterior checks are carried out on lights, indicators, tyres, windscreen wipers, brake pads, handbrake travel and exhaust, while in the car, the dash lights and horn are checked and the service indicator is reset. An interim service is carried out every six months or 8,000km and many of the same checks as a full service are carried out. Elite Servicing is a one-stop shop for motorists as not only can you get all of the above done, but Ian and his team also sell new and second hand vehicles. As an independent dealer, Ian has the ability to source any vehicle that a customer may be interested in and the showroom at their premise is always stocked. Their parts department is well stocked and Ian uses two local motor factors to make sure that no vehicle is waiting any longer than necessary. Elite Servicing is built on organisation and efficiency and Ian admits that he is happy with the direction of the business.